Preacher Canyon was named after a preacher that homesteaded in the area. His name is not known. History reports he shot his gun off during the Pleasant Valley War of the late 1880's to detour intruders entering the canyon. The Pleasant Valley War was a feud between the Grahams and the Tewksburys. Basically an argument over sheep and cattle, go figure! 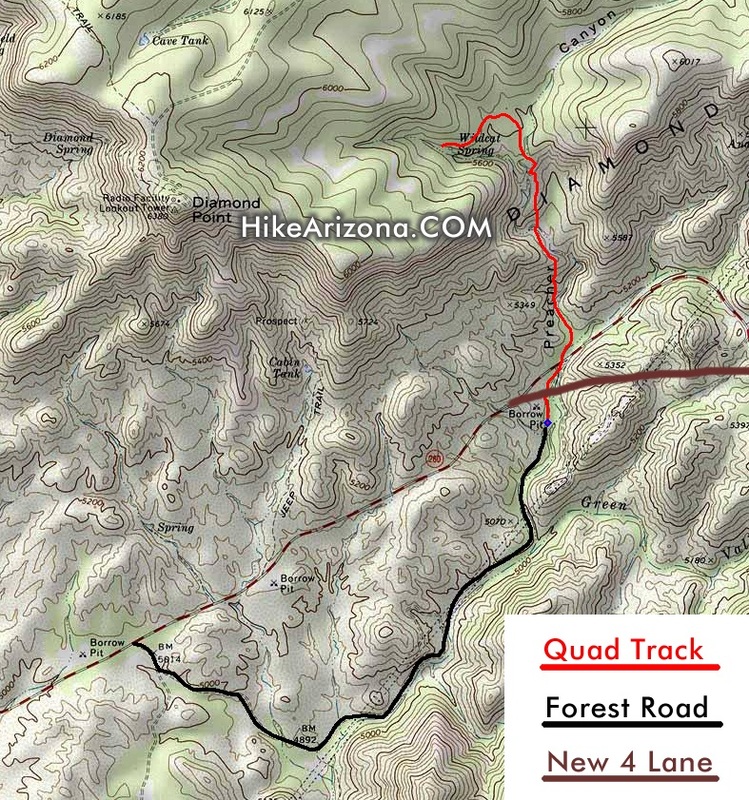 This hike probably won't appeal to most as it follows a quad track. Nevertheless, it's a good starting point if you're looking to explore the area. Check out the map below. Data given is for the red line which runs from the borrow pit to Wildcat Spring. A borrow pit is simply a pit or excavation area used for gathering earth materials such as sand or gravel. The black line is either a forest road or a power line access road which dead ends near the borrow pit. You can hike or bike the road in if you like. In fact you can bike the whole route if you have a death wish. Since this is in the Tonto National Forest and it's not a designated wilderness you are 100% guaranteed to find trash. Generally represented in the form of beer cans or shotgun shells. Oddly enough this area has a high concentrate of water and sports-drink bottles. Either the mountain bikers are changing morals or the partygoers have turned health conscious. The forest road (black line) more or less ends at a barbed wire fence. Which as of this writing was cut but you can't really drive much further. You immediately go under the new alignment of US 260. It's best to pick up the canyon on your left. (just veer left and follow the creek bed) If you continue to follow the road you will likely follow the old US 260 alignment. The road of which was remarkably removed and restored to a natural environment. I hiked the road and didn't know until I got home and downloaded my gps route that I was on the old alignment! Anyhow, if you do hike the road you will need to make a seemingly unwise left, which forces you to backtrack. Soon you face a couple steep ascents. I suppose this is a jeep route but I'm calling it a quad track. I simply can't imagine a jeep coming down these slopes but I'm probably just naive. You could follow the creek bed for an entirely different experience. Though it's tough to force yourself through the hurdles knowing the road is present. After two and a half steep sections the quad track levels out and twist through the forest. It's hard to believe you came through all that trash and under a highway but you're finally in something resembling what most think of as a forest! This experience lasts for about five minutes before you reach Wildcat Spring. The hike presented is pretty short. Grab a topographical map and make your own loops. If you're one of those spelunker dudes bring a flashlight. From the 260 / 87 intersection in Payson go east on 260 nine miles. Sorry but I didn't pay attention to the road name as I was using GPS. I believe it's FS 436.